This item is currently not available for sale. Please send us an email to be put on wait list. Older name - Vintage Keeper 500 with Glass Door - Double Deep Wine Bottle Storage. Black available in glass, Mahogany in Lexan / Plexiglas - for now. Available in your choice of Black Ebony or Mahogany Wine finish. The color samples displayed above are meant to be a representation of the Vintage Keeper finishes. Individual computer video settings may skew the color representation. Not meant to be built in, please allow ample space around the cabinet. See Manuals & Warranties tab for assembly instructions. HELPFUL HINT - write serial number down on your warranty card prior to install of the cooling unit. January 2019 - Next cabinet container for Canada is expected to May. Arrival of Wine KoolR's into the US is unknown at this time. The factory in China had some parts issues after their move in summer 2018. One key element wasn’t cleaned properly during install and so the entire line is now at a standstill. We are putting everyone on an email waitlist, we are not taking actual pre-orders forcustomers due to uncertain timelines, please inquire if you would like to be added to the list. Please specify if you want to be on the US or Canada wait list. May 2015 - QUALITY ALERT - we find that the finish on some of the cabinets is not up to our expectations. Please be advised that with a recent move of the factory in China the quality control has not been as strong. As such, there may be minor imperfections in the finish. Please note, this does not affect the overall quality of the cabinet and the Wine KoolR's can not be beat in price or longevity in the market - in production since the 1980's. We do feel the need to point these recent issues out to our customers to maintain reasonable expectations. VINTAGE KEEPER changed the branding of the name around 2013 and is now known as WineKoolR or Wine KoolR. A variety of sizes are available ranging from the smallest Imperial Slimline with 110 bottle capacity to the largest Goliath Double deep cabinet which allows for storage of 800 bottles. The newly designed Vintage Keeper - WineKoolR wine cellars have 20% more bottle capacity, lightning fast assembly and over 200% more insulation value than the older generation of Vintage Keepers. The cabinets are made of reinforced stackable heavy duty honeycomb plastic which allowed the opportunity for increasing the insulation levels while reducing the overall weight and size. The shelves are also made of plastic with metal support bars running throughout. A neat new feature - Different than the older generation: The current cabinets are "hot air up" meaning they need unobstructed air flow at top of cabinet, but this allows the cabinets to be placed closer to the wall at the rear of the cabinet. November 2014 - The BLACK - Ebony cabinets have all reverted to being a glass door. For now the Mahogany cellars will have bullet-proof (Lexan) glass doors (like Plexiglass), but this could change at any time. The production of older version of Vintage Keeper was likely stopped around 2009, all units produced since then are new material, new format, new sizes. These Wine KoolR cabinets are NOT meant to be built in. They need LOTS of space for air circultation. At a VERY MINIMUM you need. 3" space needed at back and on sides for ventilation and 4" space required on top BUT we do not recommend putting the cabinet into a confined space. Ultra-quiet digital wine cooling unit. Temperature range 52 to 64 degrees or set to Celsius. The Vintage Keeper ™ is a top-exhausting wine cabinet and therefore is not to be built-in in any way. The Vintage Keeper is to sit in a climate controlled room that is well ventilated. These wine cabinet are not meant to be built in. Only units which specify “zero-clearance” or “built-in” can be built into cabinetry. Cold cellars, garages, attics, hot laundry rooms, or outdoors are not suitable places for a Vintage Keeper to be placed. The room in which a Vintage Keeper is placed must not exceed 80F / 27C. Not designed for commercial use. Bottle capacity is based on standard bordeaux bottles with a 10% mix of half bottles - so the actual bottle capacity indicated may be slightly overstated. These cabinets are rated in bottle capacity by very efficiently loading bottles into the cabinet; the manufacturer has been able to achieve the stated capacity based on standard bordeaux bottles and 10% half bottles but you will likely have slightly less bottle capacity based on various sized bottles. Please note, some manufacturer's may indicate large bottle capacity for similar size cabinet but this may entail a large amount of bulk storage which can be awkward. 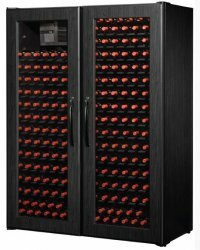 The Vintage Keeper Wine Cabinet is built to CSA-US, CSA-Canada and CE International overall certification. Vintage Keeper wine cabinets in older generations have also been known as: VP, NUVO , TWE , Tuscany Plus, Odyssey or Tuscany Odyssey. Black - Ebony Exterior . Vintage Keeper cabinets are distributed throughout Toronto, Mississauga, ON, Ontario, L5T 1K4 & L5S 122, Canada, as well as in Phoenix, Arizona, 85001, United States of America. These unassembled cabinets are widely available throughout the US and Canada. Drop Shipped directly to you so you are guaranteed the most up to date technology! The Vintage Keepers are a curbside delivery. The Vintage Keeper boxes will arrive on one skid. Please ensure someone is on hand to receive the delivery. Please ensure to inspect condition prior to signing for the delivery. DO NOT REFUSE SHIPMENT if a single box is damaged or the glass door has broken en route. Please indicate on shipping paperwork when signing for shipment and CONTACT US - You will be shipped any needed parts. It is too costly to refuse the entire shipment AND will cause unecessary delays in processing your order if a new cabinet order needs to be processed. Vintage Keepers are shipped unassembled unless otherwise specified. 1 year no hassle Vintage Keeper‚™ manufacturers warranty, just send in your warranty card. Extended warranty on the cooling unit is available: - only purchase as needed (allows for purchase of cooling unit at a reduced rate depending on how long you've owned your cabinet. Please note that the Vintage Keeper‚™ manufacturer does not provide warranty outside of continental United States and Canada. Alaska and Hawaii are NOT covered by the warranty. Please see manuals above for the assembly instructions.